The wellness industry never ceases to amaze the consumers. Each day there is something new to explore and be a part of and this makes it even more alluring. 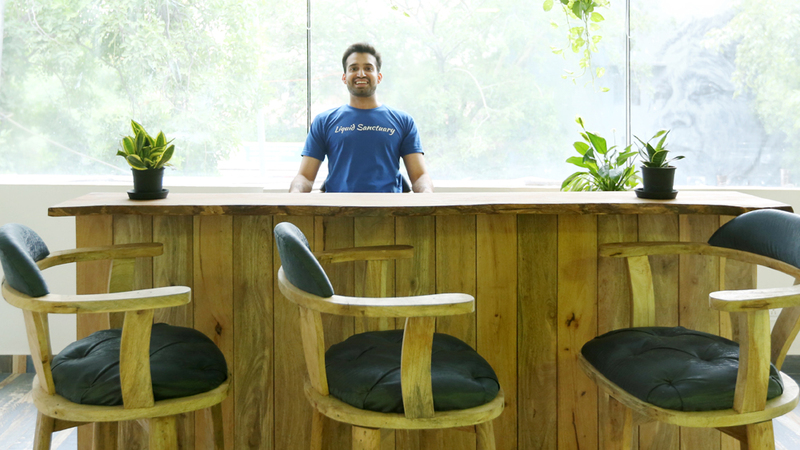 In a conversation with Wellness India, Mr Chirag Lilaramani, Co-founder, Liquid Sanctuary, shares the idea behind introducing floatation therapy in India and being the only brand with a unique concept in the wellness industry. How the idea of liquid sanctuary took form? The Idea essentially came about because I loved floating myself. It was part of my weekly routine every Sunday. Floatation is quite popular abroad in a lot of countries including Dubai, Australia, New Zealand, USA, Canada and all over Europe. I felt the Indian market would be great for such a thing and having no competition would help the business grow. The chaos in India is perfect for an isolation tank. Share about your entrepreneurial journey. I had recently moved to India from New Zealand and didn’t ever like the idea of working for someone else on their terms. I discovered the ease of doing business in India is unlike any other country and I enjoyed the challenge instead of being discouraged by the bureaucracy. I ventured out to several real estate agents, water filtration companies, carpenters, painters, Glassmakers, Electricians and sourced out material at the best rates possible all over Delhi. I thoroughly enjoyed being the architect, contractor and interior designer for the entire project. Apart from setting up Liquid Sanctuary in Delhi, I have set up a property relocation business in New Zealand. Also, I had a learning experience trying to bring Camel milk into the NZ market. Occasionally assist my father with his business in Dubai. Kindly elaborate on the unique concept and what benefits can one reap from it? The general idea behind the concept is to deprive the human mind and body of any external stimuli for ultimate relaxation. All five senses are minimized which induces the mind into the theta state, which is only experienced by veteran meditators. The benefits of being in theta state for extended durations are increased immunity, Stress Relief and Increased creativity, learning & memory. Your body, on the other hand, is relieved of any muscle tension. Athletes use it to speed up recovery by using the tank to release any lactic acid built up during training. It’s been proven that this acid is released at a much faster rate in the float tank than anywhere else. They can hence continue their vigorous training because their muscles are not sore as they normally would be if they didn’t include floatation in their recovery routine. The high content of Epsom salt in the pool also means your body would be completely exfoliated of all the dead skin, the scalp is cleansed and hair naturally conditioned. Floatation also relieves symptoms of jet lag, hangovers and can be used as a tool for learning (with the help of underwater speakers) and meditation. We are officially the only ones in India offering open style tanks for floatation which completely erases the fear of claustrophobia. First timers are hesitant to step into a typical pod style tank which appears to be cramped. Are there any business tie-ups/collaborations? We are in the process of collaborating with Yoga teachers, Physiotherapists, Massage therapist, dance teachers and hydro-therapy specialists.A lot of Gyms in Australia have floatation rooms for their clients so that it becomes a part of their post workout ritual. We will be reaching out to gyms to discuss housing a float tank at their venue or have tie-ups in terms of special prices for their members. Did you raise funds or was it bootstrapped? The investment is not much so we didn’t seek out for investors. It’s completely owned and operated by us. Are you looking forward to any expansion plans? Liquid Sanctuary is trademarked and yes we are planning to open another one in Mumbai. We are also open to set up float tanks for existing spas, gyms, airports, hotels or private homes. The wellness industry is an ocean of opportunities and ideas. Anyone can dive in and bring out new trends and innovations to ensure well-being in the lives of the consumers. Floatation therapy is a new concept in India but is widely popular abroad. Such new concepts and unique ideas are something which is driving the wellness industry and bring in waves of changes.